I'm on another stint of trying to eat better and it's been going pretty well. In the last two months I've lost nine pounds. During this time, when I'm in the mood for dessert, I usually make a dessert "pudding" by mixing Greek yogurt with unsweetened cocoa powder and a couple of Splenda packets. If I have strawberries, I cut up a few of those and throw them in, then garnish it with a tablespoon of slivered almonds. It's really pretty good. Ed's not a fan of the Greek yogurt so I'll do something else for him. Last night, I was jonesin' for a little dessert but since I haven't done a food shop in a while I don't have Greek yogurt or berries in the truck. I was stuck. I opened the pantry and stared into it for ten minutes hoping something would appear. And something did. An idea. 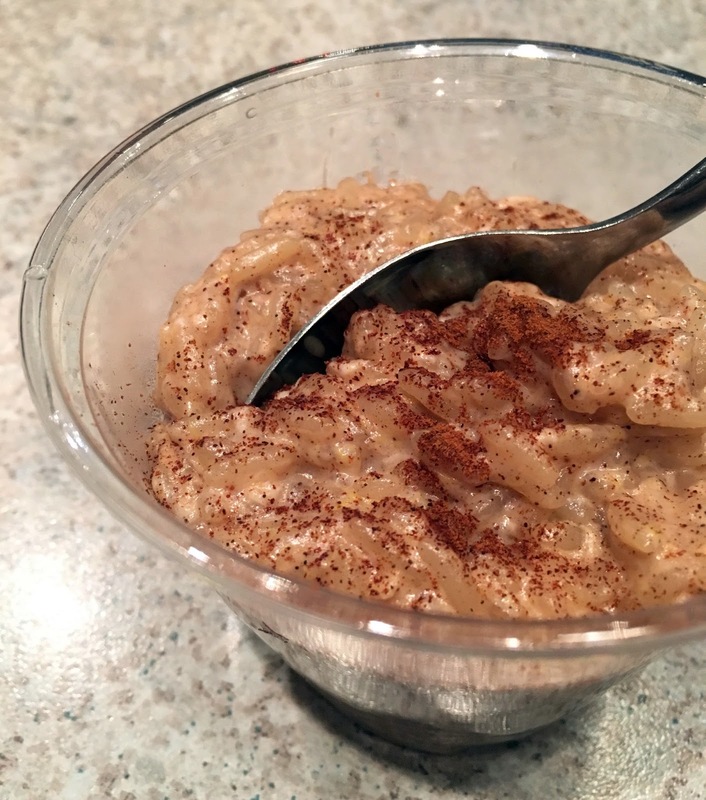 It might not be the best idea, because it involved carbs and I've been limiting those, but I looked at what I had and realized I had the basic ingredients to make rice pudding. And I loooove rice pudding. It's an uncomplicated dessert that's comforting and delicious. The only problem was that the rice pudding I usually make is my Aunt Ronni's Rice Pudding, which takes too long to make. It's thick and amazingly creamy, but I'd need at least an hour. I didn't have an hour. And, I didn't really need a whole pot of rice pudding. I just wanted a little treat. One cup for me, one cup for Ed. I didn't have a recipe, so I just put together what I thought would work for a small batch. It turned out absolutely delicious. I always have Uncle's Bens Ready Rice in the truck - it takes 90 seconds to heat in the microwave and comes in many different flavors - and happened to have a package of Original Long Grain left. 1. Beat the egg and set it aside. 2. Combine rice, cream, milk, sugar, cinnamon and vanilla in a saucepan. Using medium to high heat, let the mixture boil for about 15 minutes. Keep stirring because you don't want it to stick or burn on the bottom of the pot. It will start to thicken at this point. 3. Once you see the mixture getting thicker, add the egg and continue to stir quickly so the egg doesn't set. You don't want scrambled eggs in your rice pudding. Once you see the egg start to dissipate and become part of the mixture, put the heat on low and let it continue to thicken. 4. It'll start to set up nicely after you've added the egg. This whole process should take another 15 minutes. Once you're satisfied with the texture, take the pot off the heat. 6. Spoon rice pudding into dessert cups, top with a sprinkle of cinnamon. You can serve hot or cold. 2012: Even At 9,000 Feet Above Sea Level, He's Still A Handsome Devil! 2009: If I Had A Horn, I’d Toot It. I Do Have A Blog Though. Impressed you have heavy cream on the truck! Works great for your gourmet sauces. Do you carry shelf stable little cartons? I add slivered almonds and sometimes a little honey if needed, and mix it all up. Yesterday I popped in some breakfast cereal for crunch. BELLEDOG: I occasionally have heavy cream. This time I had it because when we had our little get together with Marlaina and MacGyver, I was planning on making fresh whipped cream and fresh berries for dessert. I made chocolate cake instead. LOL And I just buy the pint, and keep it in the fridge. The Greek yogurt with the cocoa powder is great. I was using my favorite General Foods International powdered coffee drink mix but in an effort to try to cut out some sugar where I can, I went with the unsweetened cocoa powder and Splenda. I've also mixed it with instant coffee and sliced pears into it. That's something I've been doing for over 20 years - I used to do it with Dannon plain yogurt, but now I use Greek. And when I did the South Beach Diet years ago, I made that ricotta dessert too. It was pretty good. Actually, I might have to look into that again. I can't believe you're saying the jam thing! I gave Marlaina that very trick. Much better than buying fruit yogurt sugar-wise, and if you buy something like Polaner All-Fruit, it's pretty good. I find, for me, that a teaspoon of the jelly works just fine for a 1/2 cup serving. I don't know about the coconut oil though. Another favorite for Greek yogurt - and what I had for breakfast this morning - is to take 1/2 cup Greek yogurt (Fage is my yogurt of choice, and I buy the 2% or full fat, no 0% fat for me...it tastes like crap), 1 Splenda packet, 1 tablespoon of organic unsweetened coconut flakes, 1/2 large peach (diced), and 1-2 tablespoons of slivered almonds. I LOVE that breakfast! I've also done the 1/2 cup Greek, sliced strawberries, and either granola (although that's a little too fattening), or Kashi cereal. It adds crunch, which I like. Love your breakfast ideas. Totes getting the coconut flakes and a peach. Yum.